I thought of old George when I read this article reporting that some banks, amazingly, have decided to once again offer zero down payment subprime mortgages. Apparently it’s only taken ten years for banks to forget the lessons they purportedly learned during the last subprime mortgage lending bubble, when the collapse of countless numbers of bad loans brought the economy to the brink of total disaster. According to the article quoted above; “Borrowers can have low credit scores, but have to go through an education session about the program and submit all necessary documents, from income statements to phone bills. Then they go through counseling to understand their monthly budget and ensure they can afford the mortgage payment. The loans are 15- or 30-year fixed with interest rates below market, about 4.5 percent.” In addition to the “education session” and documentation and counseling requirements, recipients of the loans have to live in the houses with the mortgages. The lending agencies think that residency requirement will keep out the investors looking to flip houses, which is one of the conditions that contributed to the prior housing bubble and subprime mortgage debacle. Another purported protection against disaster is that the housing market is strong, there’s a shortage of homes for sale at entry-level prices, and therefore homeowners who can’t make their payments supposedly will be able to sell their houses and repay their mortgage loans. And proponents of the lending program say it helps poor people and working families to buy houses and build personal wealth. I’m all for people becoming homeowners if that’s their dream, but if banks think that things like education sessions and counseling are going to allow them to avoid problems when the economy turns — as it inevitably will — they are dreaming. It’s not hard to forecast that some aggressive loan officers will push the rules, some house-flippers will figure out a way to take advantage of the programs, some bad apples will take out the mortgages and then abandon the houses when times get tough, and then we may well be back in the same perilous situation that existed in 2007 and 2008. I hope not everyone has forgotten what happened to bring on the Great Recession. And I hope some political leader makes it clear that banks are welcome to follow whatever practices they think are appropriate for their businesses, but this time, if it all goes to hell, taxpayers won’t be bailing them out — again. You’d think that, after the crash of the housing market, the failure of banks, the stock market plunge, and the Great Recession of 2008-2009 that still is affecting the economy in many parts of the country, modern Americans would have learned a painful but lasting lesson about taking on too much debt. It looks like you’d be wrong. The Federal Reserve Bank of New York report on household debt says that Americans are collectively approaching the record level of debt that we had accumulated in 2008, and probably will break through that record this year. According to the report, by the end of 2016 our collective household debt, which includes everything from mortgages to credit cards to student loans to car loans, had risen to $12.58 trillion, which is just below the 2008 record of $12.68 trillion. Even worse, last year our debt load increased by a whopping $460 billion, which is the largest increase in a decade. Mortgage loan balances are now $8.48 trillion, which accounts for about 67 percent of the total debt load. And the total amount of debt increased in every category being measured. The experts say there’s reason to think that 2017 is different, because there are fewer delinquencies being reported now — about half as many as was the case in 2008 — and fewer consumer bankruptcies, too. Who knows? Maybe the banks that are extending all of that credit are a lot more judicious in their loan decisions than they were in 2006, 2007, and 2008, and maybe Americans have become much more capable of juggling enormous amounts of personal debt. And maybe we’ll all live happily ever after in the Land of Narn. It’s a good illustration of how people have changed. Anyone who lived through the Great Depression was permanently scarred by the experience; they became forever frugal, suspicious of any kind of debt, and relentlessly focused on building up their savings and paying off that mortgage so they and their friends could hold a “burn the mortgage” party. The lessons they learned during the Great Depression were still motivating their decisions decades later. The “Great Recession” clearly hasn’t had the same kind of lasting impact. It seems that modern Americans just never learn. The Wall Street Journal reports that, sometime this year, the collective credit card balances for Americans will hit $1 trillion. That’s just shy of the all-time record — $1.02 trillion — that was reached in July 2008. We all remember what happened after July 2008, don’t we? Subprime mortgage defaults soared, the housing market crashed, Wall Street firms toppled, and the American economy stood on the brink on catastrophe. Credit card debt wasn’t a primary cause of the Great Recession, but in those tough times many American families recognized that owing too much money wasn’t particularly prudent and they needed to change their ways. Any financial advisor will tell you that racking up substantial, long-term credit card debt isn’t a good practice, and that people would do better to set budgets, establish personal savings to provide a cushion against unexpected costs, and live within their means rather than borrowing for nonessentials. Americans aren’t very good at that, however, and they’ve got short memories. When you combine the mounting credit card debt with the declining savings rate in America, and then you read stories about how almost two-thirds of American families couldn’t handle an unexpected $500 car bill or a $1,000 hospital bill, it makes you wonder whether we’re on the brink of another big economic problem. Why are Americans like the grasshopper in the tale of the ant and the grasshopper? One of my retired friends who enjoys light reading about behavioral economics says that discipline views it as a combination of a desire for immediate gratification and a kind of paralysis in the face of potential financial problems. He notes that even when Americans take courses on basic personal financial concepts and thoughtful planning, the lessons just don’t sink in, and the old bad habits remain. At some point, however, the piper needs to be paid. People who live from hand to mouth, with maxed-out credit cards that require large monthly payments, might avoid complete disaster and make it to retirement, but with it’s not going to be the retirement of their dreams. Without any personal savings, and with only Social Security to fall back on, they’re looking at “golden years” that are distinctly grim. There’s a reason the grasshopper in the tale usually ends up in a threadbare coat, begging for a handout. Wait, what is this — 1997? The story details the Obama Administration’s concern that while the housing market is getting stronger, not everyone is benefiting. That’s because banks are leery about making home loans to new borrowers and people whose credit scores are iffy. As a result, the Administration is trying to encourage banks to make more loans using programs funded by taxpayers that insure banks against loan defaults, including programs of the Federal Housing Administration. The Obama Administration wants lenders to use more “subjective judgment” in making loans and wants to make it easier for homeowners whose houses are underwater to refinance their loans. The article further notes that, since the Great Recession hit in 2008, the government has been insuring between 80 and 90 percent of new home loans. One of the principal federal agencies involved is the FHA, which allows borrowers with credit scores as low at 500 or down payments as little as 3.5 percent to get home loans. Banks aren’t going down to that low end of the scale, however. The average credit score on FHA loans now is 700, because banks are worried that if their loan portfolios are hit with defaults they’ll be held responsible — so they’re playing it safe. From 2007 to 2012, banks rejected loans for 90 percent of applicants with scores between 680 and 620. It’s amazing that, so soon after an economy-shaking recession that was largely caused by a massive housing bubble and ridiculous lending practices, regulators would be urging banks to loosen up their loan portfolios, make “subjective” decisions, and rely on the good ol’ taxpayer to insure them against risky lending practices. It appears that banks have tried to learn their lesson and not repeat the practices that made The Big Short such a wild romp. Don’t we want banks to be prudent? And why should the federal government be insuring such a large percentage of new home loans, anyway? If so many loans are being made to people with strong credit scores and meaningful down payments, why should taxpayers be standing behind 80 to 90 percent of those loans? Don’t we want banks to make their own credit decisions and take their own risks? Oh, and one other thing: the article talks about how owning a home helps build a family’s wealth, and notes that without looser loan standards many young people will be forced to rent rather than buy. This seems like ’90s-era thinking to me. The reality now is that many young people don’t want to be tied down to an immobile asset that consumes a huge chunk of their monthly paycheck and won’t be paid off for 30 years. They like renting because it gives them flexibility and the chance to pursue those good-paying jobs that are so hard to come by and might just be in another city or another state. With some people saying the economy is teetering on the brink of another recession, can you blame them? We’re starting to learn more about what was in the “fiscal cliff” measure that the President supported and Congress cravenly passed at the eleventh hour. Of course, the information shows that the legislation is loaded with targeted provisions, tax breaks, and loopholes for special interests — just as any rational person predicted. For example, the bill included a film production tax credit for Hollywood that allows deduction of millions of dollars in production costs if a TV or movie production occurs in an “economically disadvantaged area” — whatever that is defined to mean. Supporters say the tax credit helps to keep productions from going overseas and “helps get investors who would like to have a significant impact in their taxes reduced.” Sure, sounds good! Let’s make sure that Hollywood fat cats get a bit fatter, so producers, directors, and actors can continue to make sober public service announcements that lecture us not to engage in the crazed gun violence that every Hollywood production seems to glorify. And I’m sure we can all be confident that the millions of dollars that the Hollywood moguls and “stars” have contributed to political campaigns had nothing to do with Congress’ reasoned judgment to extend this tax break. In the bill there’s also a tax break for NASCAR, to allow accelerated (no pun intended) depreciation for anyone who builds a racetrack. Apparently all of the races on TV and gear that you see people wearing are misleading and, in reality, NASCAR is struggling and needs all the help it can get. Perhaps the tax break recognizes that high gasoline prices have hit the owners of those powerful, gas-guzzling cars even harder than they hit the rest of us. As the Washington Post reports, the fiscal cliff legislation also includes tax breaks, tax credits, and subsidies for banks and multinational corporations, Manhattan apartment developers and railroads, and even manufacturers of plug-in two-wheeled electric scooters. With our current system, it’s all about who you know, who you can afford to hire to lobby for your cause, and whether they have the access and power to make sure that, when the last-minute deal goes down and an emergency bill is passed that the vast majority of members of Congress haven’t even read, your pet provision is included. It’s a great system, if you are one of the people who can afford to play the game. If you’re one of the rest of us, who can’t afford a gold-plated lobbyist to represent your interests, you’re left defenseless. Of course, average citizens are supposed to have representatives in Washington, D.C. They are called Senators and Representatives, but who can count on them to protect our interests? Most of them didn’t even read the entire bill that they voted on. From New York City comes the story of a 49-year-old man who tried, unsuccessfully, to rob a bank armed only with a toilet plunger. The man entered the bank and threatened a teller with the plunger. The teller apparently wasn’t all that threatened, the man fled, and was apprehended after a chase. He was disarmed and then charged with attempted third-degree robbery. This incident should come as no surprise. Any guy who has been forced by grim circumstances to use a toilet plunger, thrusting away and staring down, looking for signs and swirling sounds of progress in completing his disgusting chore, is inevitably on the edge of reason. And if the would-be bank robber had been engaged in repeated plunging exercises, thinking to himself as he did so that in his youth he never pictured himself as a 49-year-old engaged in such appalling pursuits, he might easily have fallen into the abyss. In such desperate straits, it might have seemed that the only way out of his plunger hell was to rush to the nearest bank, brandishing his plunger, and demand enough money to avoid having to ever plunge again. 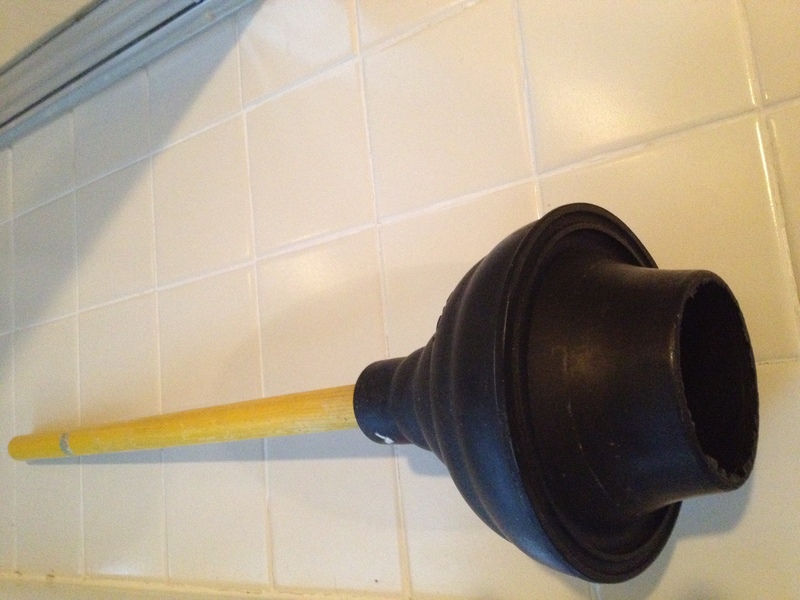 We should all show a little sympathy for the Plunger Robber. There, but for the grace of a clogged toilet, could go you or I.